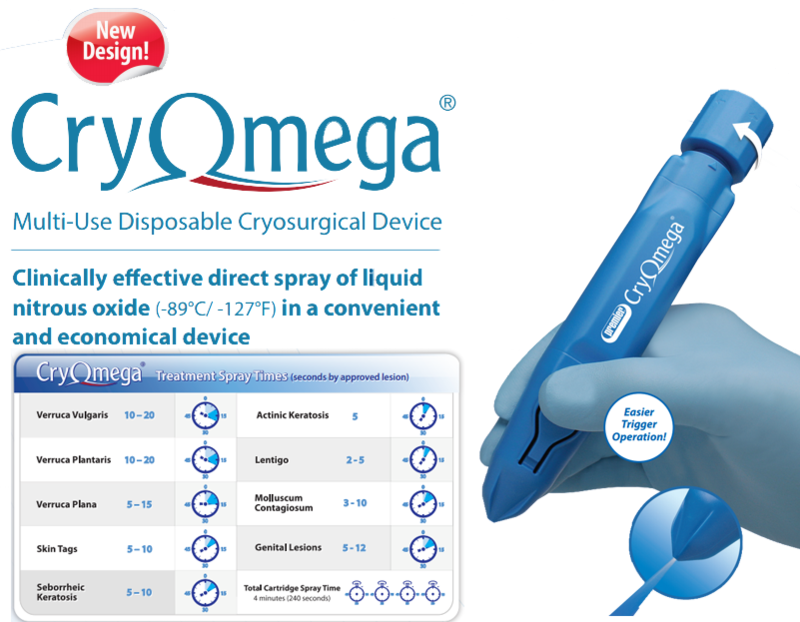 Premier Medical Products is pleased to introduce our new version of CryOmega. The new twist knob makes CryOmega easier to activate with just one rotation, CryOmega is ready to operate. Our actuation button is also easier to press allowing you greater treatment accuracy and less fatigue on your finger. Providing all of the outstanding clinical features of the previous unit, the new design of CryOmega continues as your go-to portable cryosurgical unit. Clinically effective direct application of liquid nitrous oxide (-89˚C) in a convenient and economical device. Effective - Delivers a continuous, direct spray of nitrous oxide (-89˚C) to treatment site. With a lower operating temperature compared to canister-based systems, CryOmega provides clinically effective freezing with pinpoint precision. Convenient - Simple, hassle-free operation. Activate internal cartridge once and the device is ready for use. No need for additional accessories or replacement cartridges. 240 seconds (4 minutes) of total treatment time per device. Economical - Low-cost, effective cryosurgery in any clinical setting. Disposable - Simply dispose of the entire unit when the internal cartridge is empty.